“If we had a debt crisis very clearly risk would have increased and so interest rates would have risen. But they haven’t. Interest rates have fallen, significantly, and not just to reflect inflation. So first of all we have no gilt crisis. Second, we have no affordability crisis. 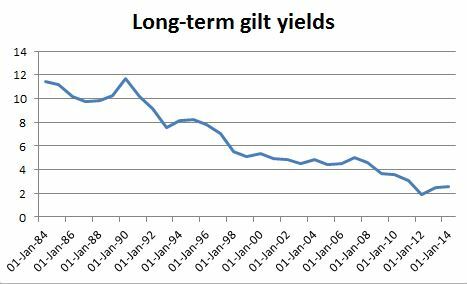 I thought i’d post a graph of benchmark gilt yields going back to 1984. It shows quite clearly that borrowing costs are at some of their lowest levels ever. There was no spike in yields during the crisis. Investors do not remotely think the government might default, nor do they think spending plans might be unsustainably high. More likely they expect years of stagnation or low growth. It’s just ludicrous to suggest, as Cameron and Miliband do, that anything other than buttock-clenching austerity will be the “path to ruin”. Any future interest rate payments on debt issued now are profoundly not the main problem. If it wanted, the government would have plenty of wiggle-room within which to reinflate the economy. The data is from the Bank of England’s series “annual average yield from British government securities, 10-year nominal par yield”. I thought this SFC model by Nick Edmonds is useful in telling the story of why low rates will be with us http://monetaryreflections.blogspot.ie/2015/01/the-problem-with-monetary-policy.html given our reliance on monetary policy (as we know it today). It is a scenario that has been played out in Japan and is continuing in the West.